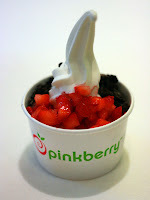 The Beantown Bloggery: Pinkberry Coming to Boston? I thought that title might get your attention. Mayor Menino is in Vegas this week for the International Council of Shopping Centers Convention and has been meeting with a bunch of retailers that hopefully will be coming to Boston soon. Possibilities include: Steve and Barry's. Ulta, Another Morton's, Another Wagamama, and last but certainly not least - Pinkberry. Menino also met with Pinkberry, a California-based frozen yogurt franchise, that is eyeing potential locations in the Back Bay, Downtown Crossing, and Fenway areas. The article is a good read. I recommend you check it out because along with mentioning the retailers, the article also mentions prospective locations for the retailers. It's fun to know what might be coming soon to a neighborhood near you. 0 Response to "Pinkberry Coming to Boston?"